View ALL beading patterns . . .
Super detailed & easy-to-follow, step-by-step beading instructions written in a relaxed, conversational style, that teach beading technique & concept, so you learn as you go. Bright, clear, high-resolution, close-up photos of each & every step. We use beads & materials that show well & annotate photos to help clarify what's happening in each step. Like A Class - Only Better! Our tutorials are like taking a jewelry making class from a great instructor - only cheaper, more convenient & with terrific instructions you can use to make the project again & again! Instantly download & view beading pattern(s) on your PC or device & get started working on your project right away! You can also print your tutorial if you want a paper copy. We want you to enjoy your beading tutorial and be thrilled with your handmade beading project. If you ever run into trouble or have any questions, we're always happy to help! Our beading patterns are copyright protected (which means you may not sell or share them). But, you may give away or sell the jewelry you make. View our Copyright Policy. Cara (my daughter) and I are a mother and daughter team of artists, jewelry designers and instructors who love to create beading tutorials that teach others how to make DIY beaded jewelry and home decor. 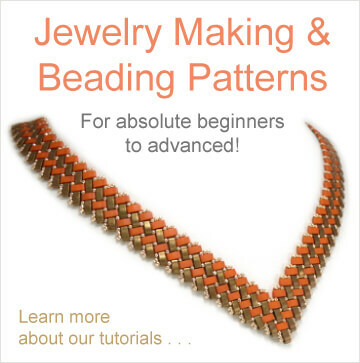 We started our first online beading pattern shop back in 2012 with just a handful of beading patterns. With a ton of hard work and a whole lot of fun beading, we now have hundreds of DIY beading tutorials (currently being translated into French, German, Italian and Spanish for our non-English speaking customers). We've also both become regular contributors to Bead & Button Magazine and have designs published in two of their hardcover books. We strive to make our beading tutorials the best they can be! 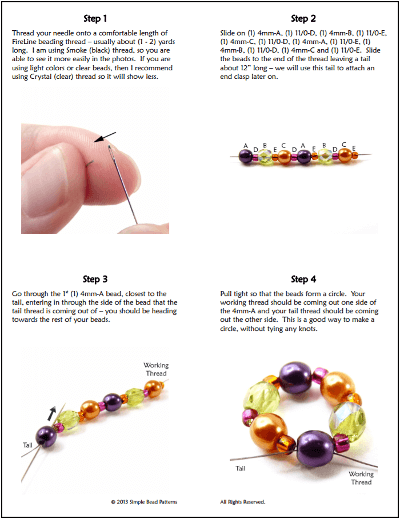 All beading instructions are written with beginner beaders in mind and feature easy-to-follow, step-by-step instructions and beautiful close-up, full-color photos showing what's happening in every step. We make no assumptions about your beading experience and never require any previous beading skills or knowledge. We sit with you (metaphorically speaking) and help you from beginning to end so that you can complete any of our beading projects. We appreciate you stopping by and hope you have fun browsing our shop. 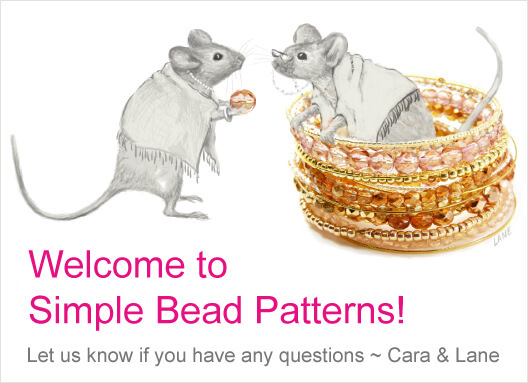 If you're new to Simple Bead Patterns, you can see what our patterns are like for free by downloading either (or both) of our FREE Beading Patterns. Please keep in mind that you're always welcome to contact us seven days a week, 365 days a year if you have any questions or concerns. And remember, we have a 100% money-back guarantee, so you can always shop with confidence and bead happy! Learn more about us . . .